After the high emotion of Euro ’96, England were quickly back in competitive action as they focused on their next key task – getting to a World Cup finals after failing to make it four years earlier. They had a new manager, Glenn Hoddle having been announced as Terry Venables’ successor prior to Euro ’96. But any hopes Hoddle had of being able to spend plenty of time during the tournament with the side he was about to inherit were quickly dashed. “These are my finals. You get yours next time,” Venables later recalled telling him, accusing his successor-in-waiting of “arrogance” in his autobiography. Although it had been an open secret during the 1982 World Cup that Bobby Robson would replace the retiring Ron Greenwood and again in 1990 that Graham Taylor was to succeed Robson, there was no official announcement made until after England bowed out. But this time it was confirmed beforehand and Venables appeared particularly unhappy with the arrangement, a joint press conference feeling awkward despite the smiles on show. 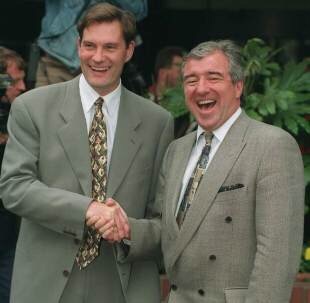 There was an uncomfortable handover from Terry Venables to Glenn Hoddle in 1996. Hoddle was therefore left looking in from the outside as England almost won Euro ’96, but he would have just two months to wait until his first match. The previous December had seen the 1998 World Cup qualifying draw made and it could probably have been kinder to England, with 1994 runners-up Italy the obvious main threat as group seeds. Poland were familiar opponents from recent qualifying groups, but Georgia and Moldova had never met England before. Both had enjoyed wins over Wales during Euro ’96 qualifying and England’s away trips could potentially be daunting trips into the unknown. Only one side would qualify automatically, but unlike when England had missed out on making it for 1974 to Poland and 1978 to Italy there would be a play-off place for the runner-up. The new boss was only 38, but already had been in management for five years. He had won promotion with Swindon Town, before a three-year reign at Chelsea had yielded no major silverware but lengthy runs in both the FA Cup and European Cup Winners’ Cup. Hoddle knew the international scene well from his playing days, where he had been capped 53 times (a criminally low figure in the eyes of his admirers). He also had experience of playing abroad and his stylish reputation as a player was mirrored in how he wanted this team’s to play. Even strong critics of his man-management skills have praised his coaching and technical abilities. Hoddle, who set about seeking to get England playing a 3-5-2 system, inherited a buoyant side that Venables had rebuilt and it would need little tweaking. David Platt was the most noticeable player to never be capped again, while Stuart Pearce had intended to enter international retirement but would remain in the side. Hoddle’s first game was a qualifier on September 1 in Moldova and it would mark David Beckham’s England debut. The 21-year-old midfielder’s reputation had grown further with his incredible goal for Manchester United against Wimbledon two weeks earlier and Hoddle now believed it was time to give him his big chance. Also making his England bow was full-back Andy Hinchcliffe as a surprise occupant of the number 11 shirt, while Alan Shearer began his reign as England captain after a summer in which he had made a record £15m transfer to Newcastle United from Blackburn Rovers. Gary Pallister and subs David Batty and Matt Le Tissier all played after not being in the Euro ’96 squad. The qualifying campaign starts with a win in Moldova. 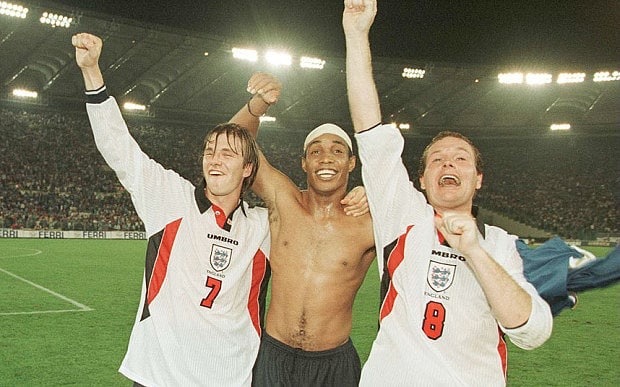 The next match was at home to Poland in October, Hoddle pairing Newcastle United duo Shearer and Les Ferdinand in attack and playing just one natural central defender in Gareth Southgate as Hinchcliffe again took his place in the side. The spirit of the summer was on show as almost 75,000 showed up, but they saw England fall behind after just six minutes. By half-time it was 2-1 to England thanks to two goals from Shearer, with the side successfully seeing the game out. Played two, won two. It was a good start for England and Hoddle and already clear it looked a straight fight for top spot with Italy, who had so far beaten Moldova and Georgia. 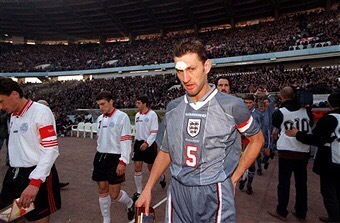 A month later England fans would unusually find the side playing on a Saturday lunchtime (UK time) for an away qualifier in Georgia, being without Shearer but welcoming back Tony Adams who two months earlier had revealed his problems with alcoholism. Hoddle stood by Gascoigne despite reports he had attacked his wife, leading to some calling for Gazza to be dropped. Tony Adams returned to lead England in Georgia. Hoddle had made a great start, but the real test lay three months away: Italy at home. England went into the showdown with Italy having never lost a World Cup match at Wembley. The Italians were back on English soil after a poor Euro ’96, in which they were the most high-profile group stage casualty. England were without some key players including Adams, Gascoigne and David Seaman. Again England fielded just one natural centre back in Sol Campbell, while further up the field Le Tissier was given his chance to start. 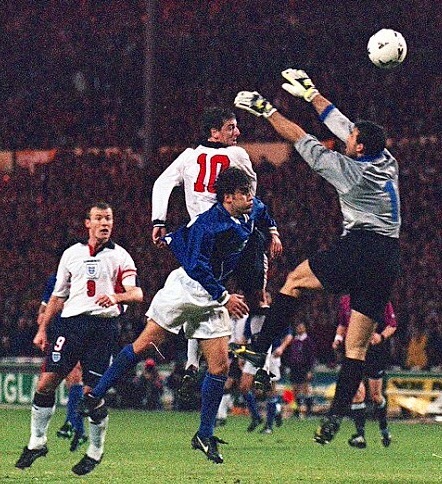 Matt Le Tissier goes close against Italy, but is never capped again. In many respects Hoddle and Le Tissier were kindred spirits, natural talents whose ability to pull off the spectacular was not enough to make them central to England’s plans. But Hoddle would show little patience with Le Tissier, hauling him off after an hour and never capping him again. A total of eight caps was considered pitiful in the eyes of the Southampton star’s admirers. Another selection of interest was goalkeeper Ian Walker, starting an international for the first time after two sub appearances. It was a big game to throw him into the side as England had to cope without the experience of Seaman. March brought Hoddle’s first friendly, a 2-0 home win over Mexico. A few days later England were given some hope when Italy were held to a draw by Poland and in late April Hoddle’s side stayed in the hunt by beating Georgia 2-0. On the eve of Labour’s General Election landslide, the old Shearer and Sheringham double act did the trick as both scored, although it wasn’t until a cleverly worked indirect free-kick ended with Shearer scoring in stoppage time that the game was wrapped up. It was to be a busy end to the season, beginning with England facing South Africa at Old Trafford in a friendly in which Ian Wright scored his first international goal since 1993 to earn a 2-1 win. But of far more concern was England’s qualifier in Poland seven days later, a match best remembered for being shown on the newly-launched Channel 5. “The channel that brings you England goals,” bemusingly proclaimed commentator Jonathan Pearce. Viewers would happily see two of them, the SAS pairing again coming up trumps as Shearer gave England an early lead – but later missed a penalty – before Sheringham wrapped up a 2-0 victory late on. It was an impressive triumph for England, who had cemented a top-two spot. It was now a question of whether they could overhaul the Italians to go through automatically, with everything to boil down to the final match in Rome. 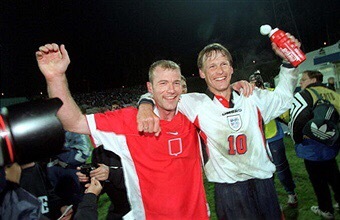 The Shearer and Sheringham double act works again for England in Poland. Before then the sides met again in France in the mini Le Tournoi competition, England turning in the style to win 2-0 and gain a degree of revenge for the result four months earlier. A 1-0 win over the French three days later meant England were surprise winners of the tournament before the final match against Brazil. Although England lost 1-0 to the world champions, there was pride and optimism as the team returned home with unexpected silverware. The question now was whether the team could repeat the success in France 12 months later at the World Cup. But first of all they had to qualify. Ahead of the 1997-98 season beginning, England were dealt a blow when Shearer sustained an injury in pre-season with Newcastle United. It ruled him out for the remaining qualifiers – at home to Moldova in September, followed by the group decider in Italy a month later. 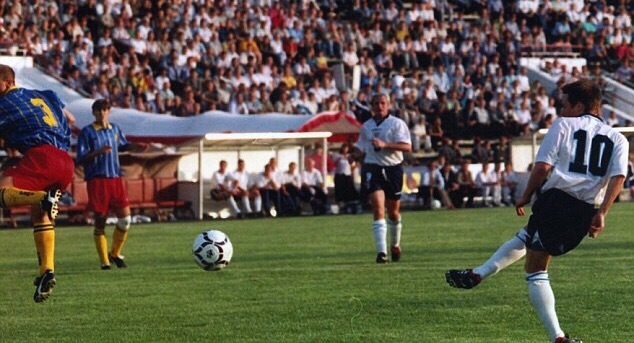 Paul Gascoigne slots home as England beat Moldova 4-0. The build-up to the Moldovan match was totally overshadowed by the death of Diana, Princess of Wales 10 days previously. With little major football action taking place in the meantime, this was going to be an emotional night and the crowd paid its respects before kick-off. Candle in the Wind was played and some candles were on show in the crowd, with the minute’s silence impeccably observed. It evoked memories of when England had hosted Albania during Italia ’90 qualifying shortly after the Hillsborough Disaster. And there would be other similarities too: England won convincingly; Gascoigne was on the scoresheet; and the Three Lions moved a step closer towards qualifying. Ferdinand and Wright were paired in attack, the latter enjoying one of his best nights in an England shirt as he netted twice, with Paul Scholes having broken the deadlock in a 4-0 win. The national mood was boosted further with the news that Italy had been held to a draw in Georgia, meaning England now topped the group. All they had to do was avoid defeat in Rome a month later and they would be through as group winners. It was sure to be a major occasion. Some of the spirit of the summer of 1996 seemed to be resurfacing, with the match getting a pretty huge build-up. “The whole of England is behind you,” Prime Minister Tony Blair told Hoddle and his players. ‘By George We’ll Do It’ declared the front page of the Daily Express with many other tabloids going down a similar line. Sky were showing it live, ITV in full on delay almost immediately afterwards. It may have seemed a lot of fuss over a qualifying match, but a combination of England’s failure to make it four years earlier, the quality of the opposition and the fact there was no guarantee the runners-up would go through in the play-offs had made this a big deal. England showed discipline in both matching the Italians and seeing the game out, on a night which was always going to seem a long 90 minutes as long as it stayed at 0-0. But during the first-half England came closest to breaking the deadlock, Ince’s powerful volley saved by Peruzzi and Beckham firing just over after excellent hold-up work by Sheringham. Italy stepped it up a gear after the break, sub Enrico Chiesa being denied by Seaman before a heart in mouth moment as Alessandro del Piero went down over Adams’ outstretched leg in the area. But there was a growing sense this was going to be England’s night when del Piero was booked for diving, before Angelo de Livio picked up his second booking following a challenge on Campbell. England simply needed to keep their heads and see the game out as the seconds ticked away. The match moved into stoppage time for an unforgettable few moments. England caught Italy on the break and Wright, who had run his heart out all night, suddenly found himself rounding Peruzzi but hitting the post from an acute angle. Sheringham was dispossessed and Italy swept away, England seeming to lose concentration for the first time in the game. Del Piero got to the byline and crossed into the area, where Christian Vieri was lurking. It looked like the most heartbreaking ending for England but he headed inches wide of the goal. Every England fan, whether in Rome or back home, breathed a huge sigh of relief. “You’ve had the drama of top-level sport encapsulated in those last few seconds,” proclaimed Sky commentator Martin Tyler. Seconds later the final whistle sounded and England were back in the World Cup finals, clinching their place on a momentous night. The Italians may have had the better head-to-head record but England’s consistency had seen them through with the most points. Their defence had been breached just twice in eight games (never on foreign soil) and Hoddle’s tactics had paid off. He shared in a jubilant group hug with his coaching staff as the final whistle sounded. On the field Wright sank to his knees in joy, having finally appeared to have booked his place in a squad for a major tournament. Sadly for him fate would intervene, as it would – for different reasons – with his mate Gascoigne who was equally ecstatic at the time qualification was clinched. Various newspaper headlines about England having achieved ‘The Italian Job’ were inevitable, but also merited. Celebrations for England in Rome. The match in Rome would mark about the midway point between Hoddle’s announcement as England manager and his departure. And it was really as good as it got, a performance that is still hailed two decades later. The qualifying campaign had been the calm before the storm so far as his regime was concerned – controversies such as omitting Gascoigne from the France ’98 squad, the publication of Hoddle’s World Cup Diary and views on reincarnation that ultimately proved his downfall were still to come. Hoddle had made an excellent start, his tactical beliefs proving vindicated. The Italy game was not a totally happy time in his life as he revealed in his diary he was planning to end his marriage upon his return home. But football-wise there would be few occasions that would rank as highly as that unforgettable night in Rome.